Fresh retelling of the Easter Story for young children, with opportunities to join in with facial expressions! This book is a bit different from others. In most books there is work for your eyes and ears. You look at the pictures, and listen to the words. But in this book, there is work for your face too! 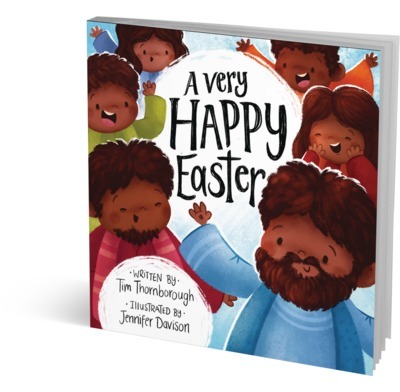 This fresh retelling of the Easter Story focuses on the emotions of Jesus' friends and invites children to copy the expressions they are making. As they learn about how Jesus died and rose again, they will see that Jesus' friends felt fear, sadness, surprise and joy, and they will have the opportunity to think about how they would have felt. This book is a great way to make story time interactive and explain Easter to young children in a way that connects emotionally and builds empathy. A wonderful Easter gift for young children. Also perfect for mums and toddler groups and to give away at Easter services and other evangelistic events. How might you have felt as Jesus was taken away to the Cross or during the dark days during his death or after you discovered He had risen? I imagine a mixture of scared, sad, frightened, but ultimately surprised, joyful and happy when Jesus rose from the dead. In A Very Happy Easter, Tim Thornborough helps kids (and adults too!) experience those various emotions through Jesus' friends who were there with him. Ultimately, they rejoice and we can rejoice too! He is Risen, indeed!